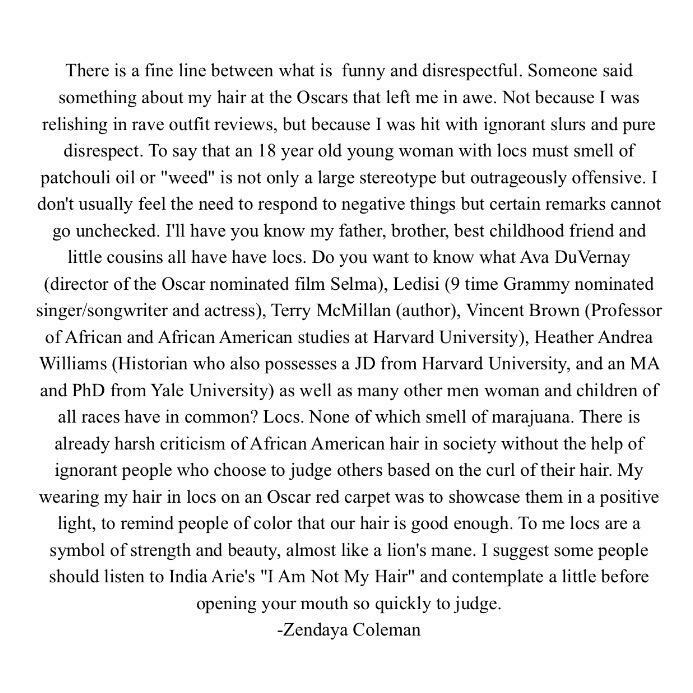 Fashion Police's Academy Awards special on Feb. 23 angered viewers after host Giuliana Rancic described Zendaya's locs as making her look like she "smells like patchouli oil." "Or weed," someone added. People were horrified at the comment, which many interpreted as racially loaded. Some also pointed out the hypocrisy of the comment, because Rancic has praised Kylie Jenner for wearing dreadlocks. Zendaya herself took to Twitter to write a passionate statement about being "hit with ignorant slurs and pure disrespect," listing scores of inspiring people who also rock the hairstyle. Rancic wrote an apology on Twitter, saying her comments had "NOTHING to do with race." Osbourne also chimed in an hour later, saying that she and Zendaya are friends. I WILL NOT BE DRAGED INTO THIS! The situation is being rectified like ADULTS by both parties. I hope you can leave it to them &amp; do the same! Osbourne denied being a part of the conversation on Twitter, saying she might leave the show because of the accusations. The post has been update as it's not clear whether Osbourne or Kathy Griffin made the comment. Representatives for E! did not respond to multiple requests for comment. On Tuesday night, E! released a video message from Rancic, apologizing to Zendaya "and anyone else out there that [she has] hurt."